Fairfax County, Va., libraries are touted as places where residents can browse the Internet, check out DVDs, and reserve e-books in addition to their traditional paper counterparts. The library system is diversifying its repertoire once again on April 22, when the county is launching the Thermal Camera Loan Program. Thermal cameras take heat map pictures representing different temperatures within a home. FCPL is making eight such cameras available to library card holders. “This is one of the first nonbook items the library has loaned out,” said Jessica Lavender, a utilities analyst with Fairfax County’s Department of Cable and Consumer Services, in an exclusive interview with 21st Century State & Local. The cameras, created by FLIR Systems, reveal hot and cold spots in the home that are invisible to the naked eye. Purple signifies cold areas; yellow signifies hot. 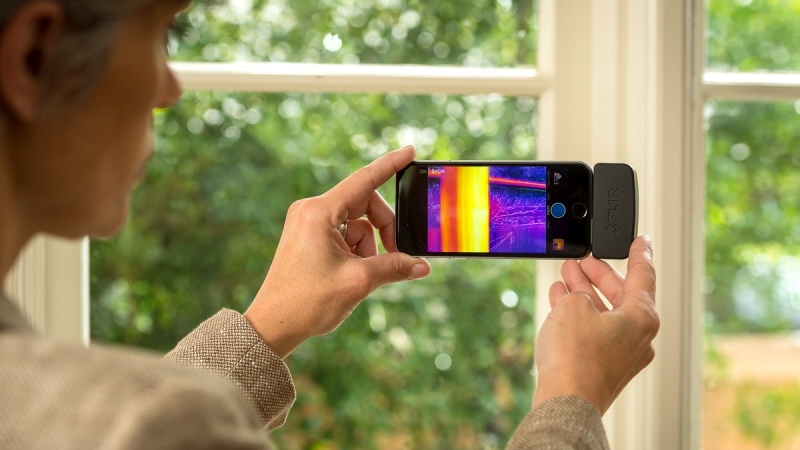 People must download the FLIR ONE application onto their phones before connecting the camera. The cameras, compatible with both iPhones and Androids, plug into the phone’s charger port. From there, users access the app, which allows them to take pictures of windows, doors, electrical outlets, or entertainment systems. Lavender said the device works very quickly; a thorough scan of an entire house takes about an hour. The cameras take both thermal and regular pictures. Lavender stated that this is a nice feature because the thermal images can make a familiar doorway or window look different enough to be confusing. Fairfax County officials coordinated their launch with Earth Day, which Lavender said is apropos because of the energy savings these devices offer. The program also gives Fairfax County residents a chance to save on heating and air conditioning bills. A news posting on Fairfax County government’s website states that homes lose $200 to $400 per year as a result of drafty doors, windows, or other air leaks. April 22 marks the first day Fairfax County residents can take these devices home; however, most people will be waiting for a while. More than 150 holds have already been placed on the cameras, Lavender said. She also said she was pleased with how much interest the program has generated. The county was able to purchase these devices through funds allotted for its environmental improvement program; the cameras cost $250 each. Lavender said the county has been planning this event since the fall; all 23 county library branches are participating. People can check out the cameras for a period of two weeks, which is the same amount of time granted to loan-out books on the library’s “hot pick” list. The cameras can be renewed as long as there are no prior holds on them.